Tumbling commodity prices and falling Chinese demand have hit African economies hard . But for all the bad news, the continent’s huge and young population still holds plenty of promise . Here are five charts that show some of the bright spots for business in Africa. In recent years, Africa has seen rapid population growth. 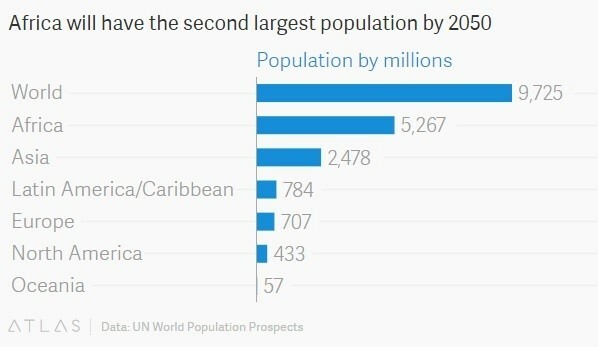 By 2050 the UN predicts there will be 2.5 billion Africans , about a quarter of the global population. And 10 of the youngest countries in the world will be on the continent. This explosion in working-age population presents a big opportunity – as young Africans move into the workforce with fewer dependents to care for, they will have the chance to accumulate wealth, savings and purchasing power, and boost economic growth. The demographic dividend is expected to generate 11% to 15% GDP growth for Africa between 2011 and 2030, the World Bank says . If sub-Saharan Africa takes advantage of this and is able to provide its expanding workforce with skills and jobs, it could add up to $500 billion per year to its economies for up to 30 years – the equivalent of one-third of Africa’s GDP. While many of Africa’s economies still face massive challenges, including poverty, disease and illiteracy, there are reasons to be hopeful that things will be different for future generations. Africa’s young people are better educated than ever before. Primary school enrollment has risen to 80% and youth literacy rates in sub-Saharan Africa, which are the lowest of any region, have improved over the past 20 years and are now about 70%. They are also likely to be better off than their parents. 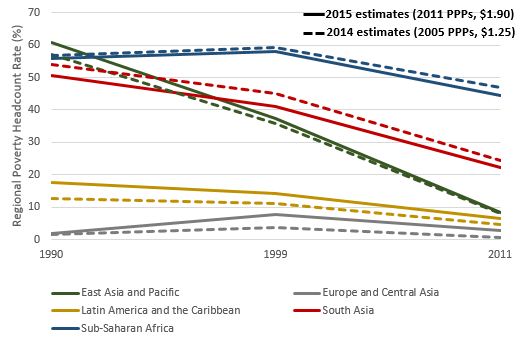 In sub-Saharan Africa, the proportion of people living on less than $1.90 a day fell from 56% in 1990 to 35% in 2015, according to the World Bank. Meanwhile, the fight against diseases such as HIV and malaria that have cut short life expectancy and productivity is slowly being won. The slump in commodity prices has dragged down growth rates – GDP in many African countries is projected to grow by over 2% in 2016. 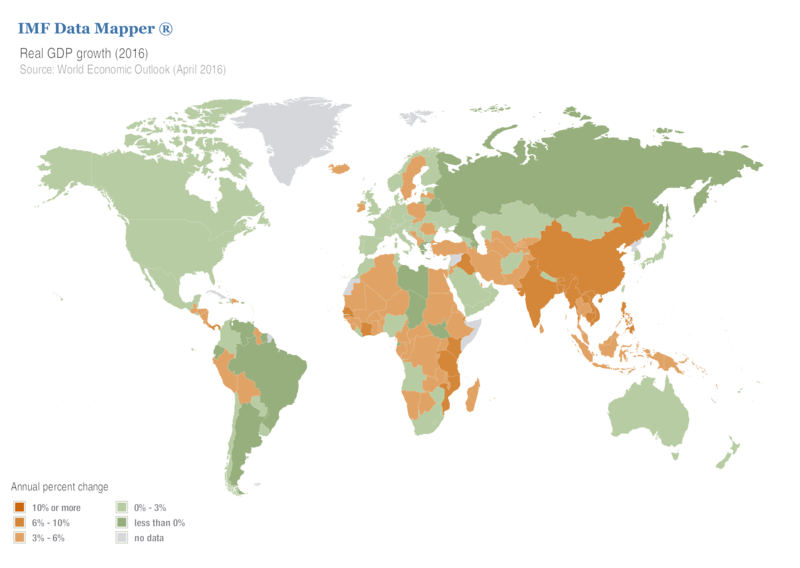 This is down from 7-8% a decade ago, but as this map from the IMF highlights it is still relatively high compared with much of the developed world. And some African economies are growing rapidly, according to the IMF’s latest World Economic Outlook . The Ivory Coast’s GDP is expected to grow by 8.5% this year – the second fastest rate in the world after Myanmar. Tanzania and Senegal are eighth and 10th on the list. Although oil and metals still remain the lifeblood of economies such as Nigeria, Angola and Zambia, there are other developments taking place above ground that are helping to drive up economic activity. As this chart shows, the number of mobile phone subscribers across the continent has surged. This in turn has driven the rise of mobile money systems such as Kenya’s M-Pesa, which are helping people manage their finances, set up businesses and move out of poverty. With a string of barriers to overcome, from high interest rates on bank loans to patchy electricity, setting up and running a company in Africa can be tough. However, things have been getting better recently , according to the World Bank, which compiles a ranking of countries’ business environments. Five of the 10 fastest reformers in the Bank’s latest report on the ease of doing business are African. Have you read? Which are Africa’s fastest growing economies? How can Africa cash in on its demographic dividend?